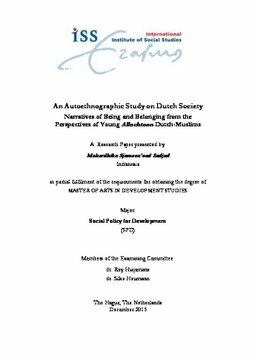 This paper wishes to understand how Dutch-Muslim youth that come from fam-ilies with migrant backgrounds give meaning to and position themselves within Dutch society. Written as an autoethnography, this paper consist of five essays that weave together my stories with those of my research participants’. Through my research, I explore the places my participants identify as essential to their experiences growing up in the Netherlands. These explorations are unpacked in this paper through narratives of whiteness, neighbourhoods, and the complexity of religious identities. I argue that these narratives are integral, not external, to our understanding of Dutch society. They represent a challenge to elite dis-courses that often generalize and misrepresent identities of young Allochtoon Dutch-Muslims.